Chicago CentriCity | Chicago-centric thoughts, words, and photos from the city around me. Chicago-centric thoughts, words, and photos from the city around me. Daniel Schell, Chicagoan. Picture-taker. Walker. If you don’t see your favorite city on this list, but you think it belongs, make me an offer. Kris Bryant, with his BP pitcher Juan Cabreja, survey the outfield. Which is actually the Chicago River. As far as PR stunts go, this one wasn’t bad. Kris Bryant of the Cubs put on his jersey and took batting practice on the lawn at River Point Plaza. With Chicagoans lined up along the Lake Street Bridge, Wacker Drive, and the Chicago Riverwalk, he took swings and launched fly balls into the Chicago River with River Point tower providing the backdrop. This was a Red Bull event, so there was plenty of pomp and circumstance, including reps with backpack coolers handing out energy drinks, and a hyperbole-obsessed MC who let the crowd know at least 174 times that this kind of thing had never been done before. I was there, and I took some pictures and video from a distance. Big screen set up at Wolf Point. …at the peanut gallery over head. KB downs a Red Bull. Construction halted so workers could watch. 355 feet down the right field line. 353 feet down the left field line. The Chicago River looked like McCovey Cove. 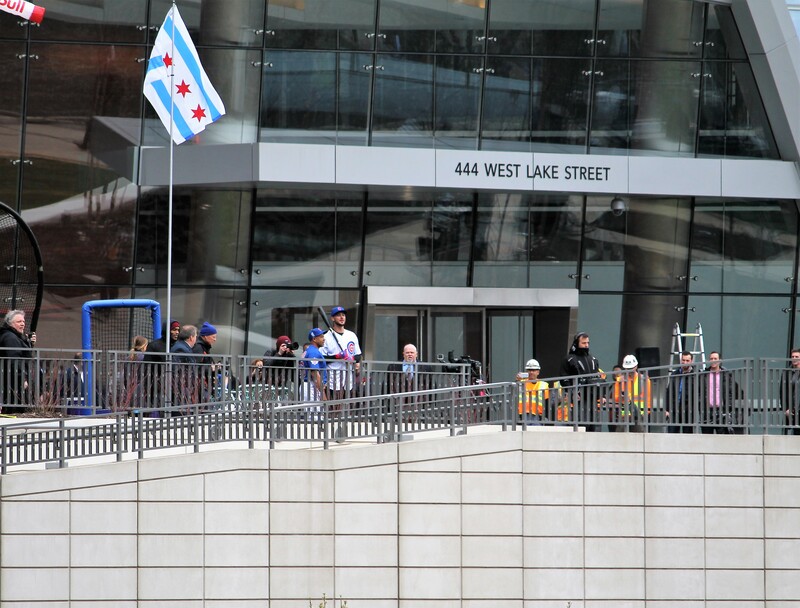 Awaiting Kris Bryant’s arrival in front of River Point. In case you hadn’t heard, Major League Baseball wants to test a new rule that would automatically place a runner on second base to start each inning, once a game is tied after nine innings, according to Yahoo Sports. **Keep in mind here, if the game has gone to extra innings, the horse is pretty much out of the barn on shortening the game. If, when hitting off the tee, a batter swings and misses, his place in the lineup is eliminated for the rest of the game, and is instead an automatic out. Come on, you swung and missed OFF A TEE?! If you insist on having pitchers — no tee — go to 2-1 counts. Two balls is a walk, one strike and you’re out. Or at least consider 3-2 instead. If a fan catches a foul ball in the air, the batter’s out. Those twin, parallel mounds in the bullpen? Utilize that technology on the field. Pitch to two hitters at once. Instead of 3 outs per inning, you get 5 outs every 2 innings. Follow me here. Every odd-numbered inning, the team at bat would have to decide, with 2 outs, whether to end the inning now, therefore allowing them 3 outs to use in the even-numbered inning that follows, or play on to the 3rd out, leaving them with just 2 outs to use next inning. So, if you’re first two batters make outs in the 3rd inning, give up now, and save that third out for the 4th inning. Apparently Joe Torre is in favor of this fiasco. So make him pitch the 10th inning for the team that gave up the lead that resulted in extra frames. Show all commercials on the Jumbotron during the action, and eliminate breaks between innings. Bring back the bullpen cart. As a bullet train. Have relief pitchers be peanut vendors. They can warm up their arms throwing snacks, so they’re ready to pitch immediately upon being called onto the field. Use FaceTime for meetings on the mound, instead of waiting for 70-year-old managers to walk onto the field, then back to the dugout. Use only ambidextrous pitchers. Arm’s tired? Pitch with the other one. Saves time warming up a new pitcher. Put low ceilings over ball fields. As anyone who’s ever played squash will tell you, that really speeds up the game. If game time is 7:10, start at 7:00. Most fans don’t show up in time for first pitch anyway. 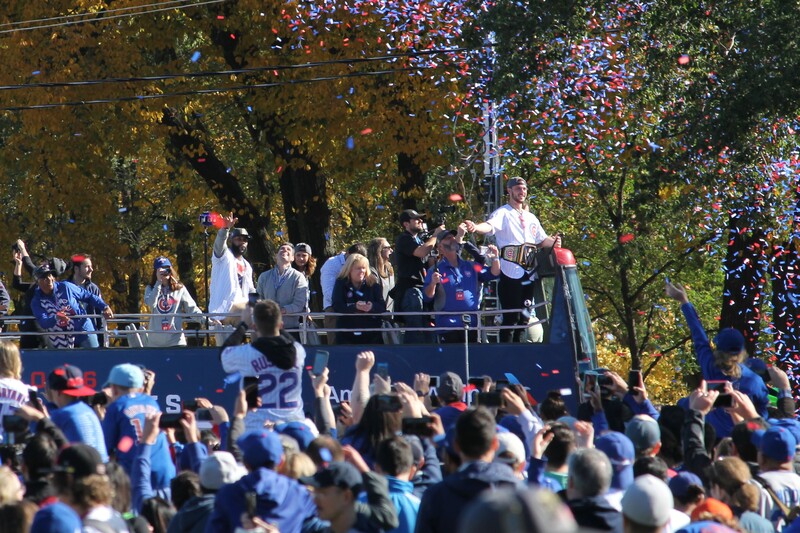 I did *not* miss a smiling Kris Bryant as he wore the Championship Belt at the Cubs victory parade. I thought I’d never admit this. Seriously. I didn’t want anyone to know. I was fully prepared to go to my grave with nary a soul finding out the truth behind one of the greatest moments in human history. But I need to get it out in the open, and let the healing begin. I missed the final out of the 2016 World Series. You know, the one the Chicago Cubs won. I missed Kris Bryant’s smiling, slipping throw to first. I missed Anthony Rizzo tucking the ball into his back pocket. I missed Ben Zobrist skipping in from left field like a child who just found a shiny nickle. I missed Addison Russell and Javy Baez meeting in midair like a couple of Cirque du Soleil acrobats. There was a pitching change. Carl Edwards, Jr. was coming off the mound. Mike Montgomery was coming in to pitch. I needed to use the restroom. So I did what you do when you have to go: I went. I thought I had time while Montgomery warmed up. Find someone who holds you like Kris Bryant holds that Belt. I was away from every television Moe’s Cantina had to offer. And the sound I dreaded, happened. First, a nervous cheer, then a quick crescendo into pandemonium. And I knew the crowd wasn’t cheering for a commercial. I ran to the sink, did a less-than-thorough washing of the hands, and ran out into the restaurant in the hopes I hadn’t really missed the culmination of 46 years of Cubs fandom. No such luck. I had missed it. And you know what? It bothers me. A lot. I feel shame. Sure, we still got to celebrate. And I got to watch, half-crying, half-laughing, as the Cubs players celebrated on the field. But I missed The Last Out. And I’ve still not quite forgiven myself. Addison Russell. I thought I’d missed him at the parade, too. The tears came back when I found this photo. Miguel Montero. That Grand Slam, Miggy. That single. The Alta Roosevelt lot in the background, way back in May of 2014. I took this from the ShowPlace ICON at Roosevelt Collection. The construction equipment was from the early work on the British School. Sadly, there is no other way to know when to put the pasta in the water. But that’s a whole other issue. What’s important right now is that you know a watched lot of dust and dirt will one day be transformed. I know, because I’ve watched that lot. A lot. 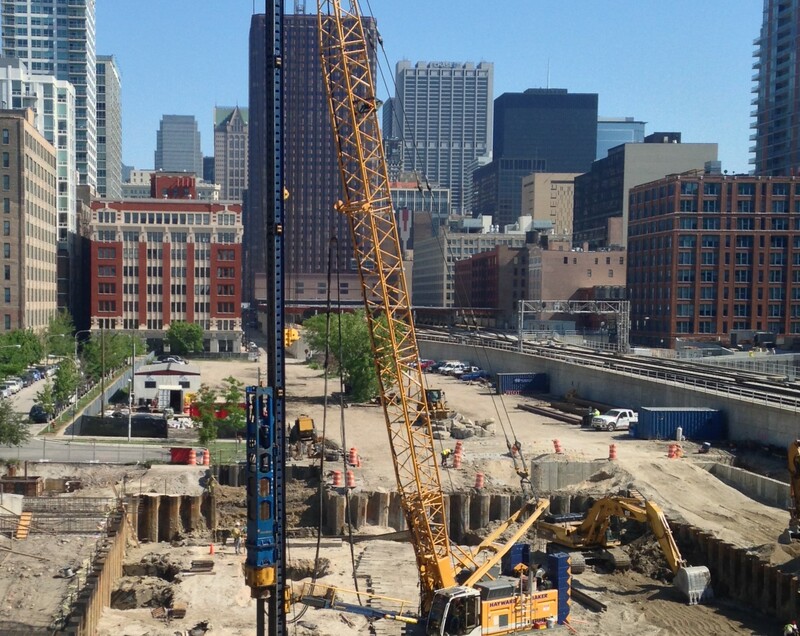 At 801 South Financial Place in Chicago’s South Loop neighborhood, Alta Roosevelt has been given the all-clear to begin digging foundations for its future 496 apartments. As we’ve reported at Chicago Architecture, the 33-story tower will have studios, one-, two-, and three-bedroom units, and a whopping 348 parking spaces to go along with them. What is a tad unusual for a new Chicago development the size of Alta Roosevelt is that early indications and renderings show no retail space at ground level. Nor any other level, for that matter. A soil-sampling rig parked in the dirt back in August. I can’t say for sure why I’ve been so anxious to see something happen at the 801 South Financial lot. I’ve visited often, mostly to watch progress on the new British School that was completed in the space just to the south. It was on one of those visits that I saw a soil-sampling rig parked in the dirt, a sure sign that development was imminent. But that was way back in August. It took seven months to finally see some action going on here. The lot at 801 South Financial Place, from the park atop the British School. There’s that soil sampling rig again. Alta Roosevelt render, from the Pappageorge Haymes Partners website. The park in the foreground will remain. Expect lots of digging. Early indications call for underground parking. Looking south from Financial Place. 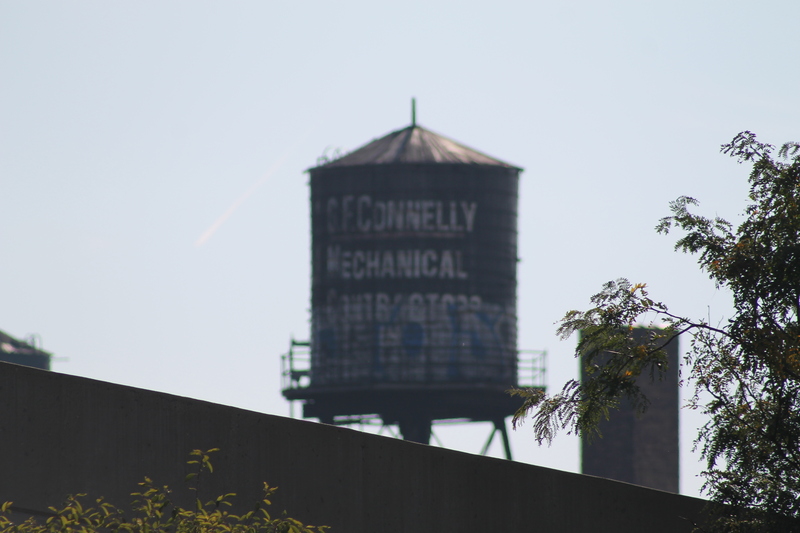 This Chicago water tank sits, for now, atop 2515 South Wabash Avenue. 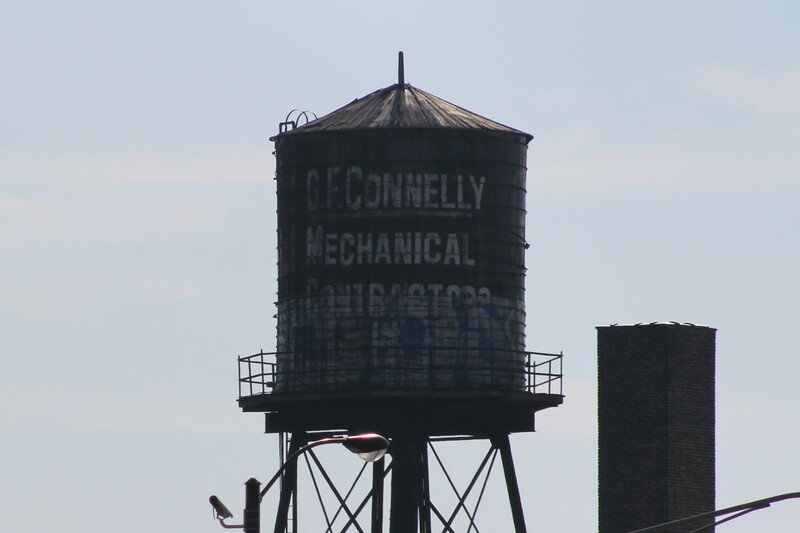 On Tuesday the 15th, the City of Chicago issued a demolition permit for the water tank sitting atop 2515 South Wabash Avenue in the South Loop. This one instantly became one of my favorites when I spotted it back in September because it’s a “character” tank. Not just one color, not just plain, but with distinct markings on it. In this case, it’s just a company name with some tagging. But that still distinguishes it from every other water tank in the city. Heck, from every other water in the world, for that matter. 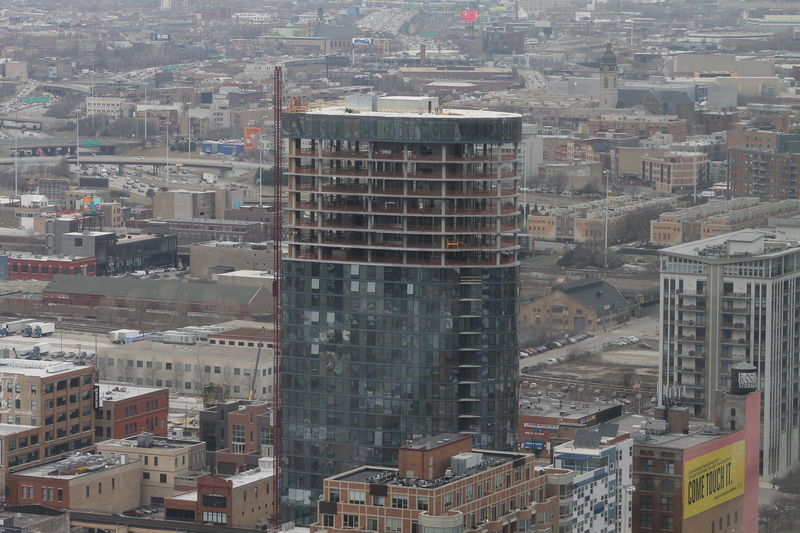 A dreary-day panorama of the West Loop. If there’s one thing you know about me, it’s probably my name. If there’s a second thing, it’s how much I love walking around Chicago snapping photos. But if there’s one thing you know about Chicago, it’s likely to be that not every day is conducive to long walks, where cold and wind can make it downright impossible to hold a camera steady. As it turns out, construction workers are a much heartier lot, and they’re tasks continue despite conditions. Lucky for me, I have my perch atop the Chicago Architecture West Loop Bureau from which to keep tabs on a whole bunch of projects and developments around the West Loop neighborhood. The Parker Fulton Market, more than half-glassed, at 171 North Halsted Street. 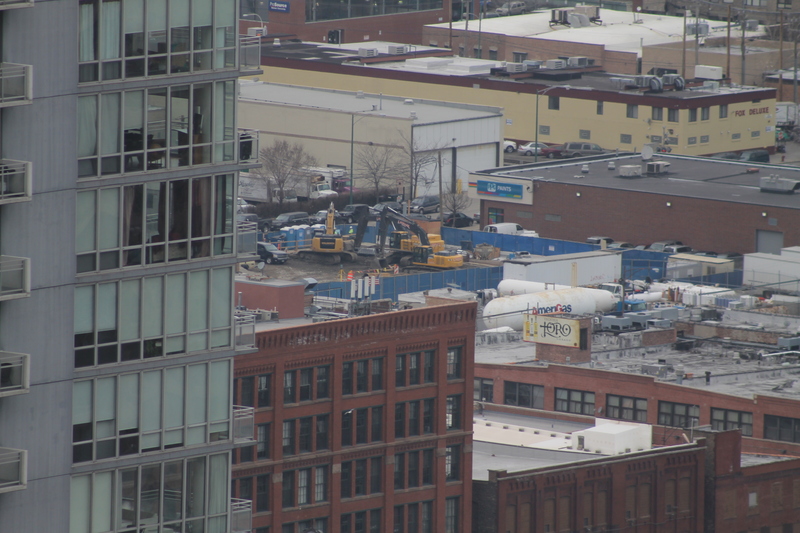 The Parker Fulton Market is the most noticeable construction site from our windows, standing just to the north along the Kennedy Expressway. It’s a project of Shapack Partners, a West Loop-based development company doing wonderful work to transform the Fulton Market District from a meat-packing mecca into a lively urban neighborhood. Topped out in December, the 29-story tower brings 227 new apartments to the West Loop, and will include 9,000 square feet of retail space. Residents should start moving into the new digs in June. Brooklyn Bowl finally got the ball rolling last year after an eternity in the planning stages. Besides a huge, fancy new bowling alley, the space will also include dining, retail, and even a live-music venue. Designed by OKW Architects, a West Loop-based firm, a key feature is the facade along Fulton Market and Morgan being preserved from the original warehouse. You can see a photo of it in the gallery below. The Ace Hotel will be a seven-story, 159-room hotel directly across North Morgan Street from the new Google building. It was designed by Chicago firm Grec Architects, and should be open sometime in 2017. Not that I’ll be able to tell; Skybridge blocks my view. See the soil sampling rig at bottom left? 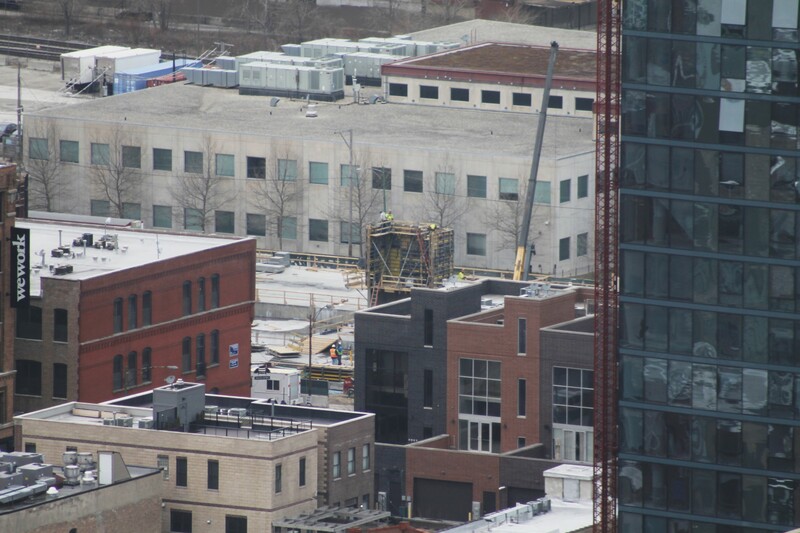 That means construction on One South Halsted is imminent. It’s not a construction site yet, but the soil-sampling rig you see in the photo above is a positive sign. It means the project known as One South Halsted has a very bright future. Finally. The 50-story tower was approved for the site, now a parking lot for the Crowne Plaza Hotel, three years ago. Designed by FitzGerald Associates Architects — yep, a West Loop firm! 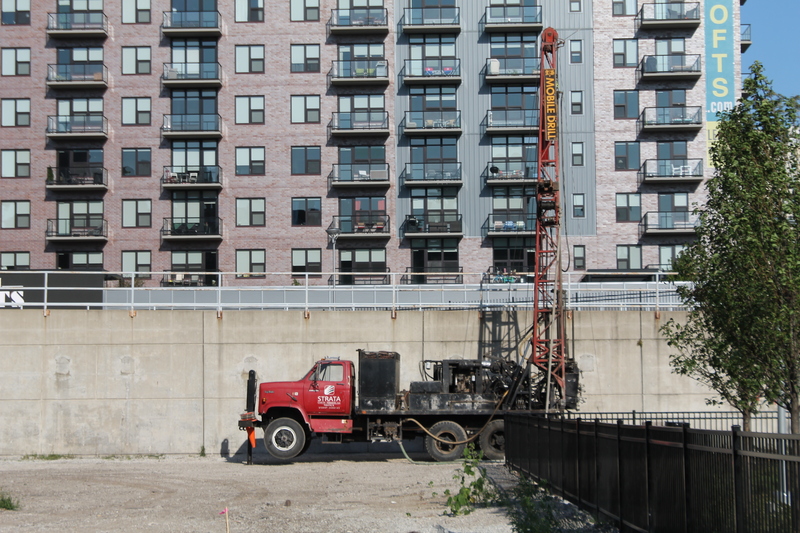 — One South Halsted will have about 500 apartment units. It will also include banquet halls, a business center, a pool, and a health club, all to be shared with Crowne Plaza guests. 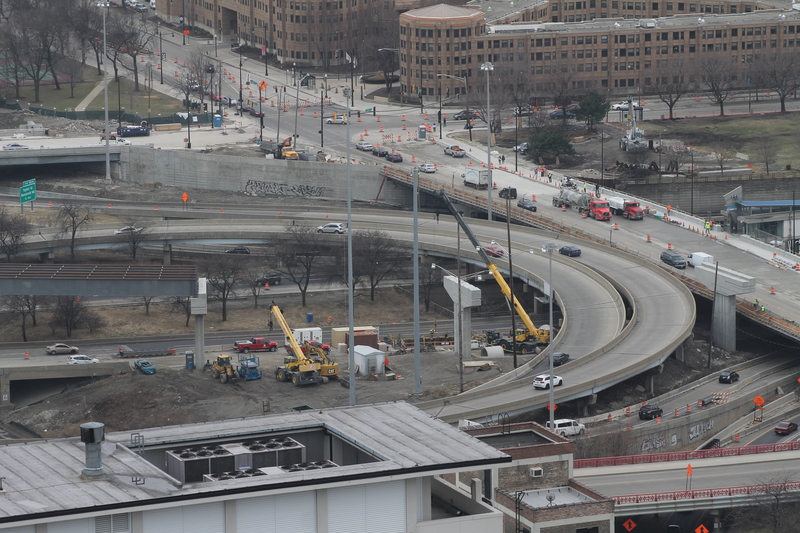 The Jane Byrne Interchange Flyover is a multi-stage construction project to restructure what Chicago sued to call the Circle Interchange. When finished, it will include a new ramp from the inbound Dan Ryan Expressway (pictured above) as well as a new ramp from the Dan Ryan onto Congress parkway into The Loop. Also included in the project is a brand new Halsted Street bridge, pictured below. 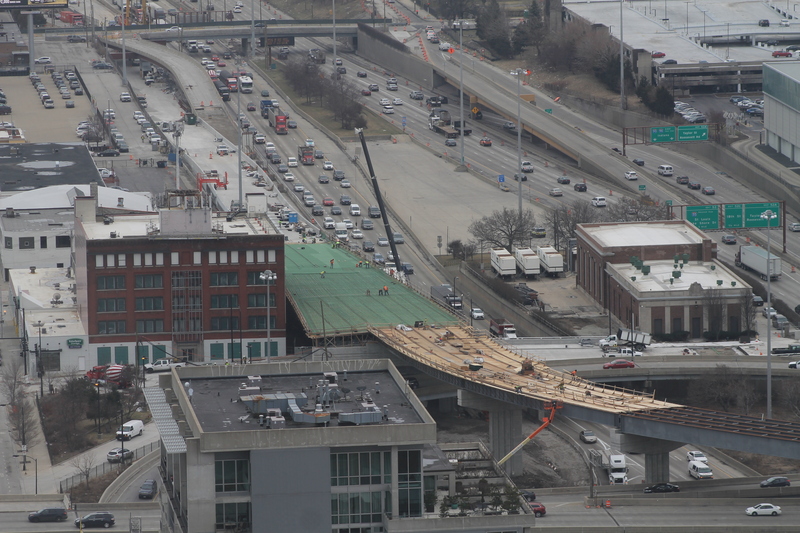 On the right, work continues on the Halsted Street bridge. At center of frame, you can see how far the Ryan-to-Eisenhower ramp has progressed. 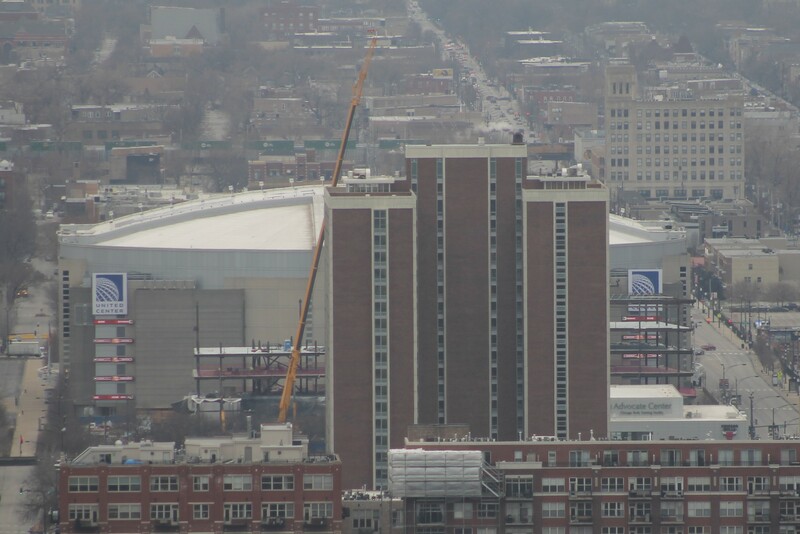 The United Center is adding a 6-story office building next door. Saying it’s in the West Loop is a bit of a stretch, but the United Center is adding a 6-story office building in the lot just to its east. In addition to housing employees of the U.C, Chicago Bulls, and Chicago Blackhawks, the structure will include a 10,000-square-foot retail store selling merchandise from both teams, and a large atrium open to the public. It’s expected to be open in time for the 2016-2017 NHL and NBA seasons. Shapack Partners, busy in the West Loop, wants to build an 11-story hotel with about 170 rooms on this lot at 832 West Lake Street. 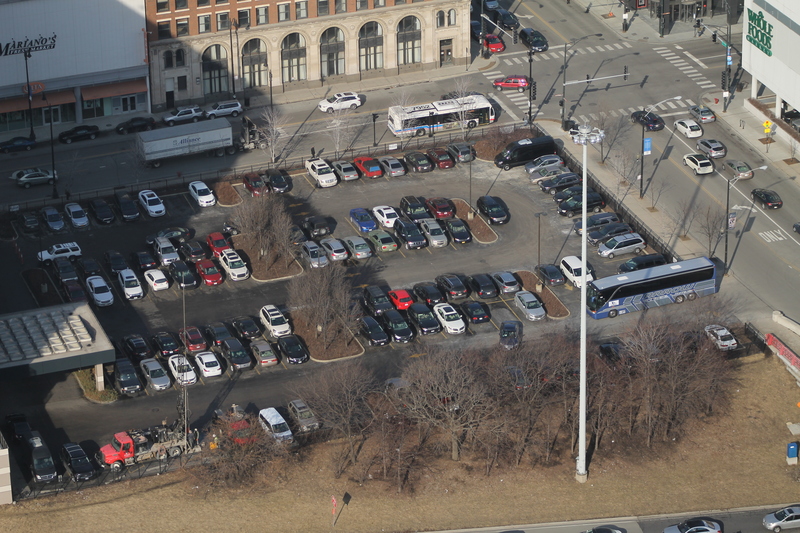 Those cars may not be park there much longer, if 111 South Peoria is approved by the Chicago Plan Commission on March 17. Directly below us is 645 West Madison, where a 20-story office building is planned. As promised, here’s the facade being saved on the new Brooklyn Bowl project. And as an added bonus, this is a photo of the facade being saved as part of the Ace Hotel. It’s being supported by three shipping containers. I thought you’d like to see how cool The Parker Fulton Market looks at night.